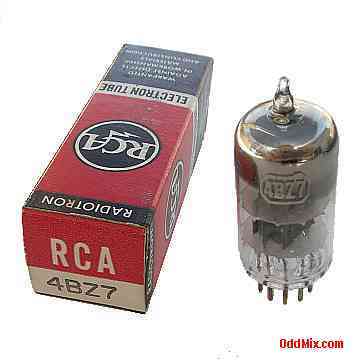 This is a genuine, vintage RCA Radiotron 4BZ7 Medium-Mu Twin Triode electron tube in it's original box. A collector's special vacuum tube. This tube was developed for direct-coupled cathode-drive and push-pull direct-coupled cathode-drive RF amplifiers. It has high enough maximum frequency to allow it's use in television tuners in the VHF range. Also a good general purpose dual triode replacement. It is new, unused, boxed, excellent condition. Useful for those antique radio restoration projects, experimentation, circuit research or to set up a private vacuum tube museum. First come first serve, only one of this rare historical vacuum tube available!